Cornish is a town in Sullivan County, New Hampshire, United States. The population was 1,640 at the 2010 census. Cornish has three covered bridges. Each August, it is home to the Cornish Fair. Established in 1763, the town was once known as Mast Camp, because it was the shipping point for the tall masts floated down the river by English settlers. Incorporated in 1765 by Colonial Governor Benning Wentworth, it was named for Sir Samuel Cornish, a distinguished admiral of the Royal Navy. Cornish has historically been and continues to be a well-known summer resort for artists and writers. Seeking a studio away from the summer heat of New York City, sculptor Augustus Saint-Gaudens began coming to Cornish in 1885. Artist friends followed him, including painter and illustrator Maxfield Parrish, who designed and built his estate, the Oaks, in the area. 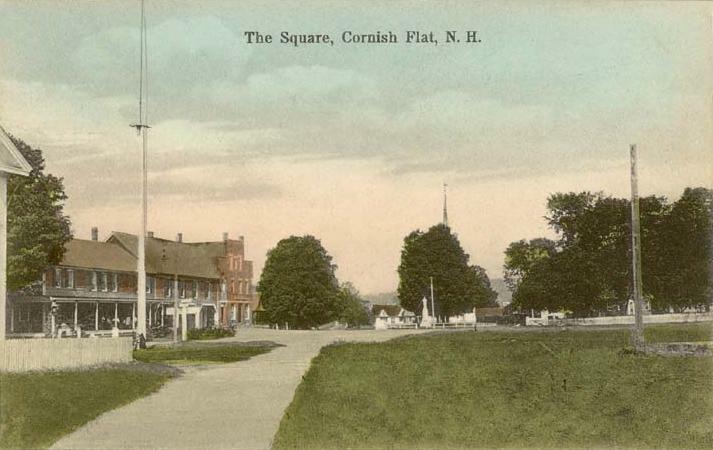 The surrounding area became the center of the popular Cornish Art Colony. Cornish is the site of the second-longest wooden covered bridge in the United States, and the longest two-span covered bridge in the world. The Cornish-Windsor Covered Bridge, which spans the Connecticut River, was built in 1866 at an original cost of $9,000. According to the United States Census Bureau, the town has a total area of 42.8 square miles (111 km2), of which 42.1 sq mi (109 km2) is land and 0.7 sq mi (1.8 km2) is water, comprising 1.68% of the town. The long ridge of Croydon Mountain follows the eastern boundary of town; the highest point in town is a knob on Croydon Mountain which reaches an elevation of 2,323 ft (708 m) above sea level. Cornish is drained by Mill Brook, Blow-me-down Brook, and the Connecticut River, which bounds it on the west. Cornish lies fully within the Connecticut River watershed. The eastern part of the town is a portion of the approximately 25,000-acre (101 km2) Blue Mountain Forest Association private game preserve, also known locally as Corbin Park, named after its founder, Austin Corbin. Cornish is dotted with several small villages, including Cornish Center, Cornish Flat, Cornish City, Cornish Mills, South Cornish, Balloch, and Squag City. Cornish is served by state routes 12A and 120. As of the census of 2000, there were 1,661 people, 645 households, and 465 families residing in the town. The population density was 39.4 people per square mile (15.2/km²). There were 697 housing units at an average density of 16.5 per square mile (6.4/km²). The racial makeup of the town was 97.71% White, 0.30% African American, 0.30% Native American, 0.12% Asian, 0.12% Pacific Islander, 0.30% from other races, and 1.14% from two or more races. Hispanic or Latino of any race were 0.48% of the population. There were 645 households out of which 32.2% had children under the age of 18 living with them, 62.9% were married couples living together, 5.4% had a female householder with no husband present, and 27.8% were non-families. 21.2% of all households were made up of individuals and 7.4% had someone living alone who was 65 years of age or older. The average household size was 2.57 and the average family size was 3.02. In the town the population was spread out with 25.9% under the age of 18, 3.8% from 18 to 24, 26.4% from 25 to 44, 31.8% from 45 to 64, and 12.2% who were 65 years of age or older. The median age was 42 years. For every 100 females there were 100.1 males. For every 100 females age 18 and over, there were 100.2 males. The median income for a household in the town was $53,393, and the median income for a family was $60,313. Males had a median income of $36,115 versus $29,474 for females. The per capita income for the town was $23,165. About 2.8% of families and 4.5% of the population were below the poverty line, including 5.8% of those under age 18 and 5.5% of those age 65 or over. ^ Coolidge, Austin J.; John B. Mansfield (1859). A History and Description of New England. Boston, Massachusetts. pp. 460–461. http://books.google.com/books?id=OcoMAAAAYAAJ&lpg=PA9&ots=cUndZkVSIF&dq=coolidge%20mansfield%20history%20description%20new%20england%201859&pg=PA460#v=onepage&q&f=false. ^ The knob is unnamed on federal topographic maps, but is shown as "Buffalo Mountain" on a hand-drawn map by Ms. Gross, town historian of Croydon. ^ Katie Zezima, "Cornish Journal: J. D. Salinger a Recluse? Well, Not to His Neighbors", New York Times, January 31, 2010. ^ Wade, M; Tracy, S.P. ; Wood, D.C. (1976). A brief history of Cornish,1763-1974. for the Town of Cornish by University Press of New England. ISBN 978-0-87451-129-1. http://books.google.com/books?id=57wMAAAAYAAJ. This page uses content from the English language Wikipedia. The original content was at Cornish, New Hampshire. The list of authors can be seen in the page history. As with this Familypedia wiki, the content of Wikipedia is available under the Creative Commons License.